At PEM Surface Creations, we have several passions. One of our passions is helping businesses create a safer environment. Our slip-resistant Aquatic Matting is precisely designed to help fight against common slips and falls. Additionally, the textured surface of our matting allows for both stability and comfort. Recently, the Hampton Dive Center installed some of our aquatic flooring around the pool in their training facility. Installing the matting around the pool will allow for added comfort when the instructors are getting in and out of the pool. Also, because the surface is permeable in nature, puddles will never form, significantly reducing the risk of slips and falls. Aside from its comfort and slip-resistant power, our PEM aquatic flooring is treated with an antimicrobial formula, safeguarding against the growth of bacteria and mildew. We are happy to report that the folks at the Hampton Dive Center are extremely pleased with our aquatic matting. 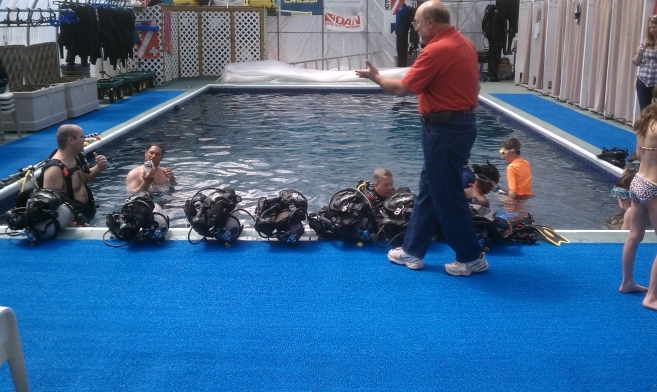 The instructors love the comfort our matting brings to their knees and feet while conducting scuba diving courses. Our slip-resistant matting can be found in a variety of aquatic centers across the country. If you would like to view some of our past projects, please feel free to browse our Aquatic Matting in our photo gallery.